There are dozens of candidates running to be 2019′s top shoe trend. Flatforms are ahead in some polls, while mules are gearing up for a strong comeback. Yet there's one shoe that has always captivated the masses: the Birkenstock. It seems the favorite footwear of crunchy moms is back in fashion. Whether you love it or hate it, facts don't lie ― it's Zappos' best-selling sandal in the summer. 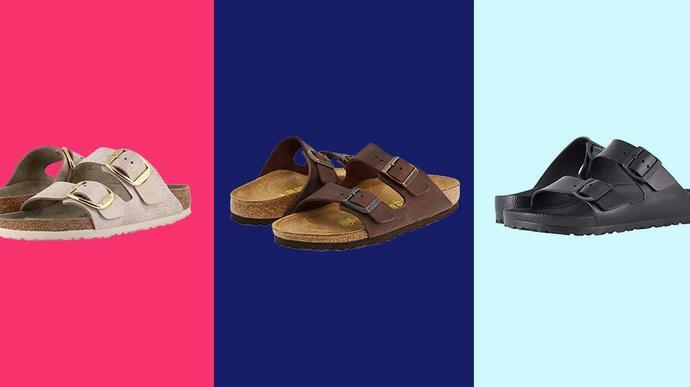 Among Zappos' most popular styles are the classic Mayari Birkenstock and the Arizona Birkenstock, which got a trendy makeover in recent years. And, because Birkenstocks are available in sizes 5 to 13.5 for both men and women, they're a great option for women with large feet. They ring up between $40 to $160 depending on the style. Most of us love to hate this shoe but likely have a pair deep in our closets or have been tempted to try a pair. They have a comfortable cork bottom that molds to your foot the more you wear them and they're 100 percent renewable and sustainable. They're even designed to encourage the natural gripping motion of your feet and improve circulation. We've rounded up some of our favorite Birkenstock styles for summer below.